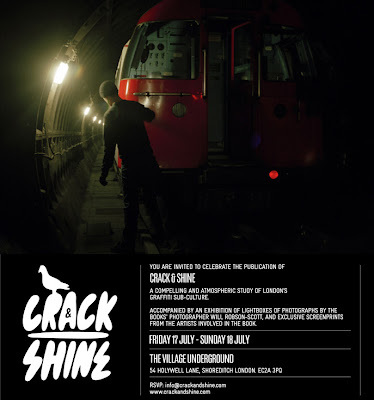 Crack & Shine, UK's first graffiti book is having their book launch this Friday 17th July at the Village Underground, in East London. The publication has been described as a compelling and atmospheric study of London's Graffiti Sub-Culture. Having seen a preview copy of the book we would have agree to with this description, the book has been lovingly put together with some fantastic photos, good design and most importantly lots of great content. The book launch will be accompanied by an exhibition of lightboxes of photography by the books' photographer Will Robson-Scott. There will also be some exclusive screenprints from the graffiti artists involved in the book.